Maniac Kickboxing Non-Stop Elite Paced Workout that Kills Stomach Fat? The video presentation on this page will show you some great tips on how to lose your stomach fat and get lean flat abs while doing kickboxing. This isn't any kind of gimmick... This is a full body workouts that stimulate the burning of stubborn abdominal fat, get faster, stronger and most importantly -- the mindset tricks that you NEED in order to maintain your own perfect body for the long term. Remember: Watch the entire video, as the end will surprise you! View on your computer or burn to DVD, or transfer it to your iPad, iPod, iPhone, or portable media player. 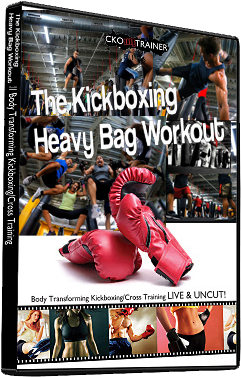 NOTE: Michael Andreula's Maniac Kickboxing Heavy Bag Workout is a downloadable Video or a DVD physical products will be shipped. After you order, you will get INSTANT ACCESS to download the Video and all the bonus classes onto your computer, iPad, iPhone, or burn it to DVD. The Video format is Mp4, which can be viewed on any desktop Mac or PC. You can use this on ipads and mobile devices. Get a Free Strikers Orientation: Learn: Jab, Cross, Hook, Uppercut, Front Kick, Elbow and Knee.